XTBA produces a broad range of products that compliment lighting control desks, dimmers, moving lights, architectural lighting etc. in all areas of the lighting industry. Our products are installed and used all over the world in both permanent installations, touring shows, cruise ships and theatres. If you cannot find what you are looking for please get in touch as it could be something we made specifically for a client or are in the middle of developing! Merging DMX is one of the most processor intensive operations in DMX - well it is if it is done correctly. There are a load of cheap merges on the market using washing machine processors and parts borrowed from the local tractor factory, buy one and enjoy the audience asking for their money back. XTBA merges are built to last, which is why we can guarantee them for life! From two into one, two into two and four into two mergers (3 of which did service on the feature film City of Ember - don't ask why, we don't know!) XTBA should have a merge to keep your lighting data secure and correctly merged. All XTBA merges have address switches that allow for one (or more) DMX universes to be offset allowing data to be overlapped or desks joined 'end to end'. Like most digital protocols DMX cannot be simply split by using multiple Y cords. It might work for a while but sooner or later (probably at the worst moment) the data will crash, therefore a data splitter is required. XTBA has been building DMX splitters for over 25 years and they can be found hidden from view in thousands of venues quietly going about their appointed tasks. From fully opto-isolated and line protected, single isolation and splitters with displays to monitor data and line termination XTBA has a splitter for all occasions - all at 'popular prices'. XTBA DMX switches allow for lighting controllers to be run in parallel for back up or in the case of the Switch 2:1 take control for remote focusing. The Smart Switch 4:2 can be set to 'switch if able' or to be manually switched. Since XTBA launched the concept of multi-point DMX 512 Distribution and the range of XTBA DMX Distribution Modules in the Spring of 1993, extensive XTBA DMX Distribution Systems have been installed at the Royal Shakespeare Company at the Barbican in London, in BBC Pebble Mill Birmingham, BBC Television Centre Studios 4, 6 and 8, RTE Dublin, RTV Slovinia, the Parliament Building of the European Union in Brussels, Expo Lisbon '98, at least 10 super luxury cruise liners, Mr. Michael Mouse's French Theme Park, and numerous others. They have proved to be the simple, reliable, and inexpensive method of connecting multiple DMX outlets and inlets together to form an integrated DMX data distribution system. No longer do multiple outlet systems require splitters and patch bays with all the complications of distribution wiring: The XTBA Distribution Modules act just like a ring main. Installation is easy, and expansion is simply a matter of adding additional Distribution Modules, with little extra time or cost. 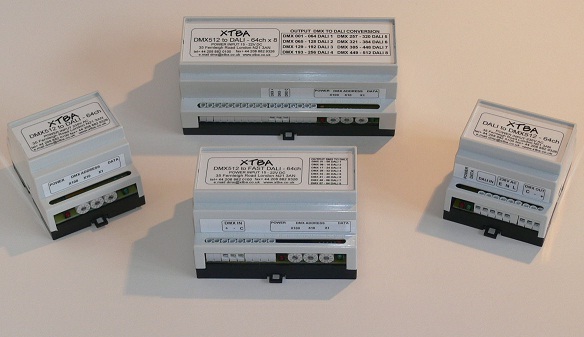 XTBA Distribution Modules are remarkably adaptable, allowing a huge range of configurations which will suit from the simplest to even the most complex installation. XTBAs range of Splitters, Merges and Protocol Converters will all run in conjunction with the Network, giving greater flexibility to your DMX system. 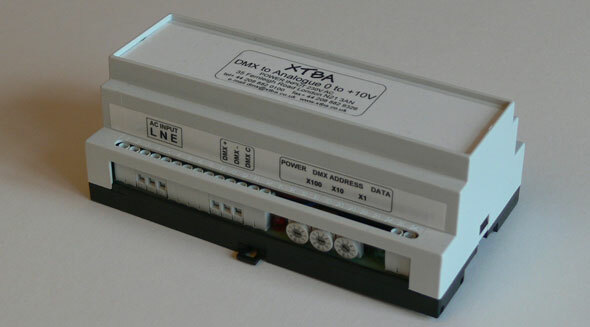 We recommend that an XTBA Distribution Module Power Supply Unit is used to power the system, our Splitters and Protocol Converters can all be modified to incorporate the power supply. From the lighting control the DMX 512 data should be fed via a Splitter or an XTBA Power Supply to the cable feeding the Distribution system. The cable can then be installed and Distribution Modules simply "cut in" anywhere along its length. By using the Distribution Splitter, multiple branches can be installed, allowing DMX access to any point in the venue. Branches are kept separated from each other, and every output module is separate from the branch. In addition to DMX512 data, each Distribution Module (Input or Output) requires +8 to +15V DC to provide power for the local circuitry. This can be supplied via a an XTBA Distribution Module Power Supply Unit for a single branch system, or via an XTBA Smart Splitter for a multiple branch system. Each branch can have a maximum of 32 XTBA Distribution Output Modules (the protocol's limit) and a cable length of up to 1,000 metres. DMX to analogue decoders are still to be found in numerous theatres and TV stations around the world. The ideal (and in many cases the only) way to interface older dimmers to DMX - oh happy days of multicore cable, Socapex and the pin matrix! A while ago XTBA installed 1,632 channels of DMX to analogue decoders in a TV studio. Some years later they needed some splitters but did not know of XTBA - until it was pointed out to them that they had two racks with 34 XTBA decoders in the basement. They had switched these on and forgotten about them for six years - they then bought the splitters from us without further hesitation! For over twenty seven years XTBA has been proud to be the UK agent for Goddard Design, and Goddard Design has been proud to be the USA agent for XTBA - well at least we hope so! 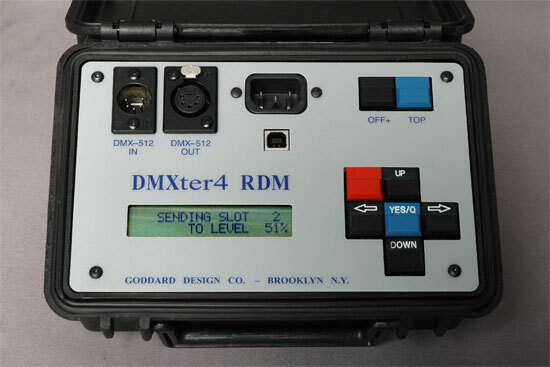 The DMXter set the standard for DMX testing and is still the 'benchmark' for all DMX equipment. 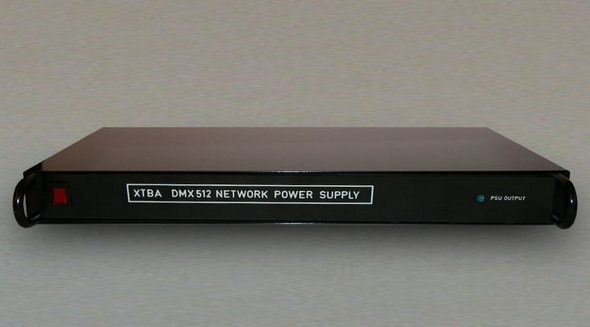 Over that time XTBA has sold hundreds of DMXters and as a testament to their outstanding reliability most if not all are still in use. We might normally expect to see one a year back for a simple repair! So 2018 marks the 27th Anniversary of the Goddard Design DMXter and XTBA becoming their UK agent. 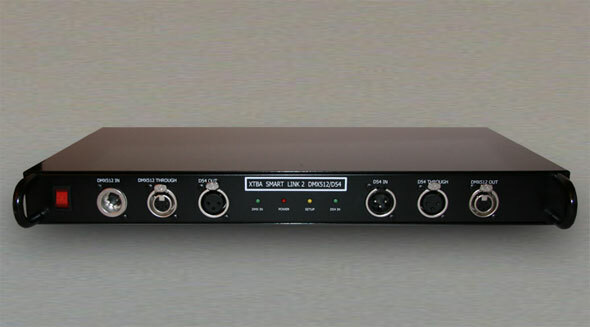 The DMXter revolutionised DMX as now you could "see" DMX in action rather than hope it was there. It introduced ‘flicker finder’ and a host of now standard (and much copied) DMX test routines. Many of those original units are still testing away and with the introduction of the DMXter4 RDM and the MiniDMXter4 will provide DMX testing for standard DMX units and the new generation of DMX/RDM products for years to come. Now there is a new DMXter, the DMXter4 RDM. It has all the original functions and a host of new ones from display to timing functions, software upgrades via USB and the addition of RDM protocol support. 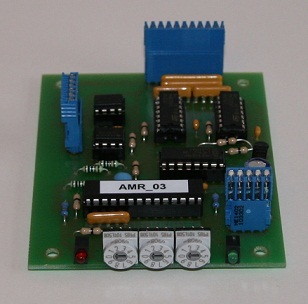 The MiniDMXter has also been redesigned to add many of the features of its bigger brother including RDM. The original MiniDMXter was limited in its functions but the MiniDMXter4 has all you need to check DMX systems at a great price. 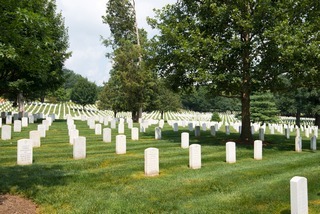 For more information go to the Goddard Design website. XTBA supplies a rack mountable product called The Audit, providing a comprehensive set of tools to make fault finding any DMX problem simple. Strand's D54 protocol has lasted a good deal longer than expected and to this day is still to be found lurking. It is an analogue protocol (and not greatest at the best of times) but a testament to the longevity of Strand's STM, JTM and Tempus dimmers which it was interfaced to. 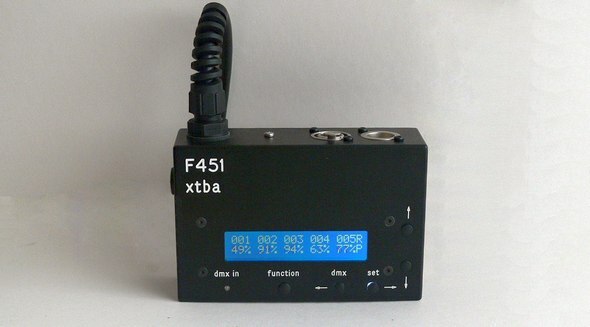 XTBA's Smart Link 2 converts D54 to DMX and DMX to D54 and there is not much more to be said! You either need one or not but now you know where to come for them! XTBA’s DMX cards provide a variety of functions to allow the user to build or customise their own projects. All the cards have full 512 address via the PCB mounted BCD switches and on board power supplies so only a transformer and XLR’s are needed. Connections via HE14/Molex connectors except where stated. Cards come with complete instructions but we are always happy to answer any additional questions. In addition we can supply any XTBA product as a card only to fit into your metal work, please get in touch with us for more details. The XTBA DMX BACKFADE is a unique multiple DMX universe show recorder and desk back up system. Backfade is a modular system so the 1U case can have from 1 to 4 universes fitted. Additional universes can be added using the slave port and slave units. Backfade is designed to be in line to the main console and can take-over a show in the event of a main desk failure. Backfade will seamlessly cross fade from the existing lighting state and then act as the main control. DALI (Digitally Addressable Lighting Interface) is the international standard of connecting lighting fixtures (ballasts) on a two wire interface network. It is beginning to be used extensively in the field of ‘architectural’ lighting for its ease of installation and control. Compared to DMX512, DALI is a very slow protocol. However offices and shopping centres have little need to run high speed chases or ten cuts a second light changes so for these installations DALI is an ideal solution. Increasingly in ‘architectural’ lighting what were once termed as ‘theatrical lighting’ DMX512 fixtures are also being used, LED lights, moving lights etc. Up to now the two could not be mixed but now they can. The DALI protocol offers numerous advantages over the older DSI protocol or analogue cabling. However DALI controllers tend to be limited as to control features and as a result more installations have become DMX/DALI hybrids. This offers the control of the DMX lighting desk and the flexibility of DALI. To aid the interfacing of these protocols XTBA introduced our DMX to DALI interface card which has been installed in numerous venues around the world. XTBA has now redesigned and updated our range of DMX to DALI and DALI to DMX products. In addition to the popular DMX to DALI PCB card, XTBA now offers a range of three DMX to DALI converters and a DALI to DMX converter as well as a DALI merge unit, all housed in DIN rail cases for easy installation. Here are a range of other products that don't really fit in with any other category of product! They include things we have made specifically for the film industry such as the Fire FX unit - this clever unit will amazingly create fire - well, it will make lights flicker randomly so that your fire looks realistic. 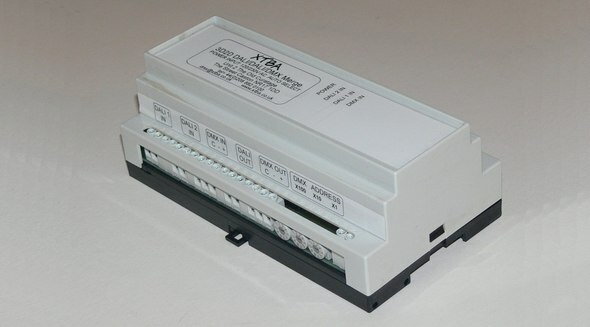 Look here for DMX to Relay DIN Rail mounting units too. Every good thing must come to an end eventually! Items here will have performed stirling service for the customers who bought them but we are now not making more of them - probably because we have run out of metalwork or PCBs! If you really need something from here, then give us a call, we may be persuaded depending on the offer!